Fill these clear personalized frosted poly mini baby shower gift bags with treats and favors for your friends and family to enjoy. You can create a custom look by choosing one of our adorable designs and up to three lines of text for a special message in your choice of letter styles. These small gift bags measure 4 inches x 3 inches x 6 inches and are transparent to reveal your color-coordinated tissue paper colors. Rigid cardboard bases inside each bag support your gifts and treats. Guests will be delighted when they see your personal message printed on the bags with a design or monogram and up to 3 lines of text in your choice of lettering and imprint color. Tissue paper not included. 2nd time ordering these for a baby shower & I love them!! Just a little bit smaller than I imagined. They did great job of printing and getting to ke on time. I wish though it was printed on both sides not just one side. 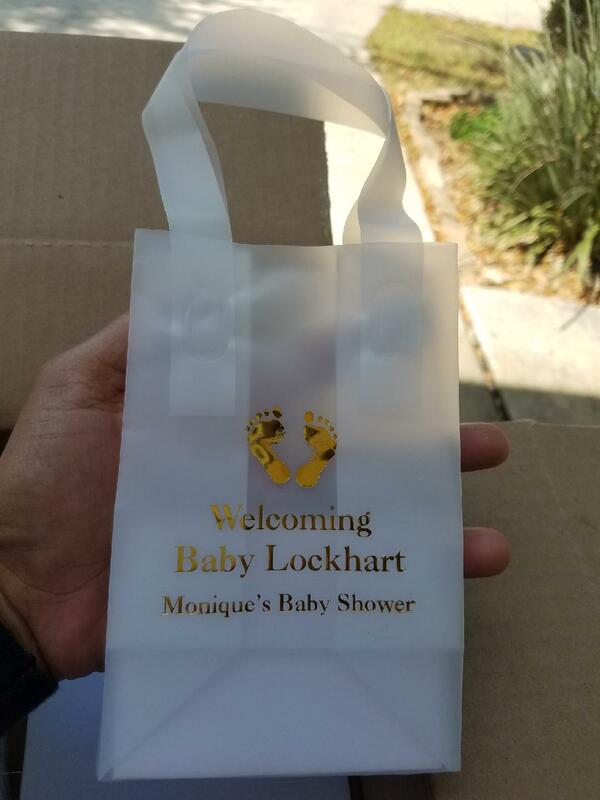 This was a product that my wife purchased for my daughter's baby shower the small little clear bags with the little baby sitting in the middle and the invite on the exterior. lovely gift bags they turn out to be exactly what my wife needed. Love the bags. Good quality. Used them for a baby shower. They were just as I had ordered them and came in a timely fashion. A really nice addition to a shower when stuffed with some personalized goodies. The bag was cute and of good quality material. It would be nice to have printing on both sides. I was very pleased with the service. When the bags arrived, ther name was misspelled. I called the next day and a new shipment was immediately sent. That is great customer service. I will definitely use your service and highly recommend it. Again, thanx for everything. just the right size, Perfect.